I've told you about Leo the least weasel baby that I'd found last year. I've also told you about living with Leo in the house and about Leo's weasel dance in the snow in my living room. But it has been pretty obvious from the beginning on that one day Leo will be released back into the wild. Or at least that I'll try to do that. According to my vet May would have been the best time. So I started preparing a new accommodation for Leo late in April. 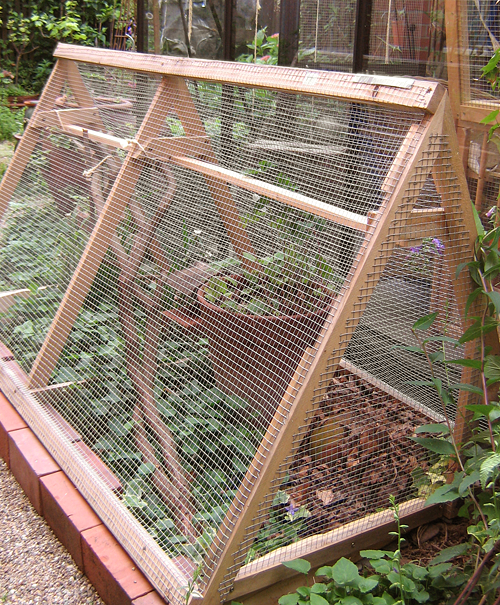 After dismissing several ideas of building a large cage in the garden I've opted for moving his current cage into the greenhouse and building a small outdoor cage with access to the greenhouse. The idea was to get him used to greenhouse and outdoor cage, then to open the outdoor cage and to let him run free with the possibility to come back whenever he wants. And of course I would have continued to give him food regularly. After clearing out the greenhouse (tons of stuff and three dead mice) and removing most of the tables and pots I also removed everything that could be harmful to a small least weasel. No sharp tools, wires, seeds or watering cans (he could be stuck in the long neck). After this performance the entire greenhouse was pretty empty. 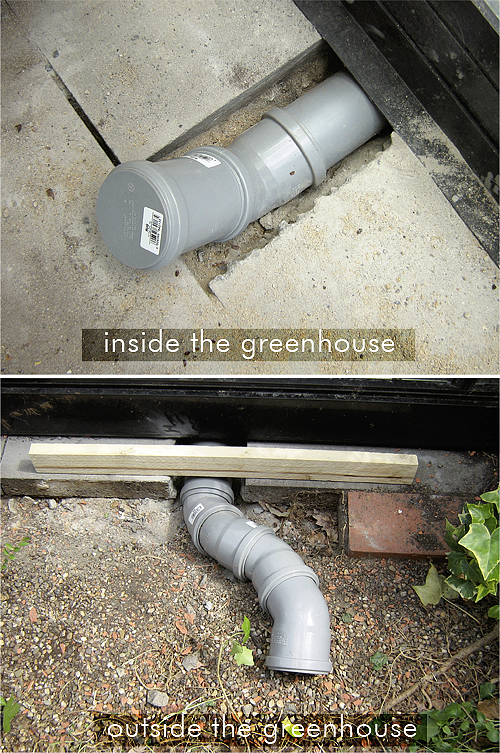 I'd planned to build the connecting passage via a tube that should go straight through the greenhouse's skirting. As this is made of coated aluminium it shouldn't have been too difficult to drill a hole through it. Wrong! The skirting is made of multiple folded aluminium and fairly thick. My brother, who helped me with this part, didn't see a chance to do this properly with his machines. Then we started with the outside cage which had to be placed right over the tube. I had left some of the fine mesh I had used for Leo's current cage. After measuring and calculating I found a triangle outdoor cage best. With the help of my DIY store I got the wooden slats cut at the angles needed. Back in the garden I assembled the outer frame and stapled the mesh to it - until the stapler broke. My brother tried to help me with his electric stapler. He spends a fortune on high quality tools, but not on this one. He normally doesn't staple anything, so he thought a cheap one would do. It didn't. It broke. I ordered a new one and waited. It was May meanwhile and it had become very, very warm. I was wondering why my clematis montana hadn't yet started to break buds. Took it so long this year because of the harsh winter? Then I realised it was dead. Frostbitten. 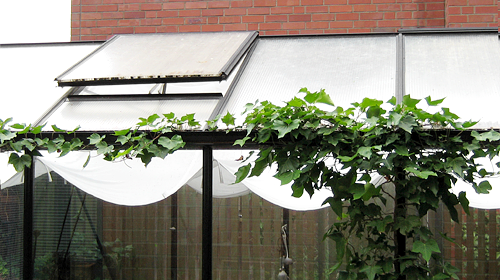 The greenhouse roof was clad with a brown tangled mess of dead clematis stems. I removed it all and cleaned the roof. Never before the greenhouse was so bare. 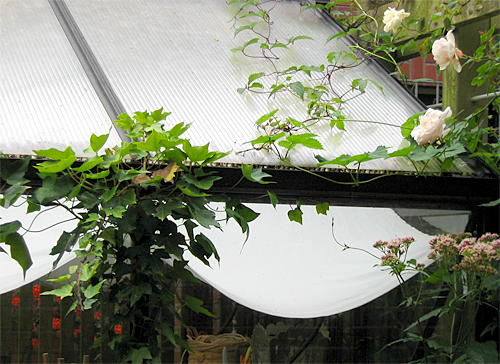 This wonderful clematis had covered the entire roof and in summer it had provided the shade that was so much needed in here. Now it became extremely hot inside and there was by far too much glare for a least weasel. It couldn't stay like that. I had to look for some kind of sunscreen. In addition, the automatic vents couldn't deal with the heat anymore. With the door closed it simply was too much. I would have to keep the door shut with Leo living in the greenhouse. But 36°C (= 96.8° F) (in May!) is not acceptable for a least weasel. So, together with a sunscreen I needed a screen door that I could keep shut but that still lets the air flow. The whole thing started to become unmanageable. Would it ever get finished? I started building a screen door from wooden slats and some left over mesh. In the meantime my new stapler had arrived and I could finish the outdoor cage. 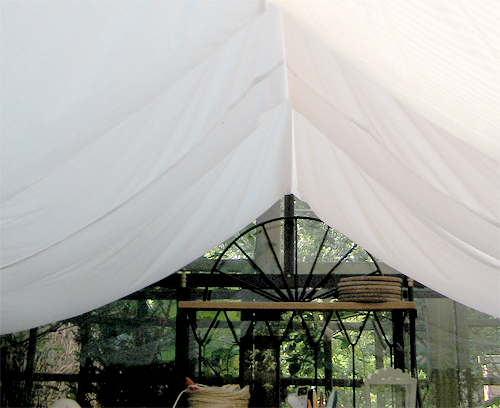 From three large cotton sheets I sewed a canopy to be fitted under the roof. Before attaching the sheets I added fly screens to the vents. The sheets were too large, building deep swags of white cotton. It looks a bit like a ballroom now. That's what I see from the kitchen window. That's what it looks inside the greenhouse. A bit too much for my taste. However, with the sunscreen, the new screen door, the outdoor cage and the tunnel between greenhouse and outdoor cage everything finally was ready to welcome Leo. Phew! Das ist ja süß, dass die Katzen sich da so einquartieren. Fütterst Du sie?